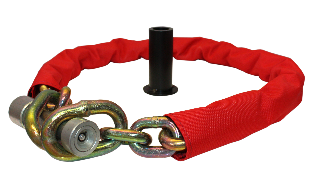 Ideal for securing Motorbikes, Caravans, Trailers, Lawn mowers and Quad bikes. The MC100S Chain lock system can be used with the flush fitting ground anchor or as a portable chain and lock bolt for securing items of high value to permanent fixtures. The MC100S has the added feature of a pair link end that allows the chain to pass through itself effectively creating an adjustable loop for a greater variety of applications. Features same as MC100 but with 6ft chain instead of 4ft. 6ft has special pear link as well as standard end links giving facility to create a noose. No padlock, uses Bulldog Super Lock Bolt with over one million possible key combinations.